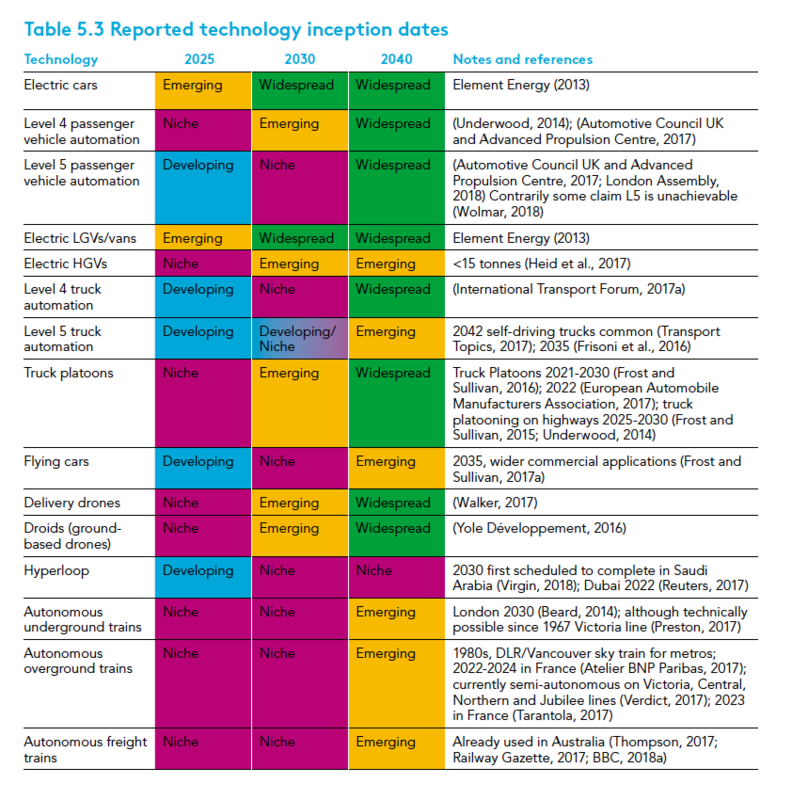 trends unmodified: the government is reactive to changes in mobility and a directed approach to reaping the benefits of new technologies in transport is limited. individual freedoms: The public demand freedom, independence, and control over their transport and are concerned about data privacy. greener communities: society is less materialistic and prioritizes the social and environmental aspects of mobility over new technology and individual choice. technology unleashed: there has been deregulation in transport and related industries, while rapid technological progress is dominated by the private sector. The decarbonization of road freight will, therefore, be important in reducing carbon emissions from the transport sector. A range of emissions-reduction measures, both in vehicle development and in logistics, are becoming available. Improvements in aerodynamics, tires, lightweight materials, eco-driver training, and dynamic route-planning can collectively lead to substantial reductions in the carbon emissions from fossil-fuel vehicles. In the longer term, however, alternatively powered vehicles will be needed if the overall 2050 target of reducing greenhouse gases by at least 80% compared with 1990 is to be reached. At a smaller scale, electric cargo bikes are a more sustainable way to move smaller loads than LCVs or HGVs and are suitable for urban deliveries. Policy interventions have a role to play in realizing this shift. Combined policy measures to reduce air pollution from freight vehicles have included the introduction of Low Emission Zones, also known as Clean Air Zones, alongside EU standards on engines. There is potential for the majority of parcels to be delivered by automated systems by 2026. A combination of self-driving vehicles – in the air and on the roads – will permit faster, more cost-effective deliveries. Forces beyond automation and electrification are set to shape the freight sector of the future in transport, last mile, and warehousing. The increasing connectivity of businesses and customers is enabling new business models to rise up in many industries, some of which fall under the umbrella term of the ‘sharing economy’. As the array of actors, technologies, business models and operational rules evolve, so, in turn, do the relationships between user, provider, and government. Looking forward to 2040, and given the scale of changes we are facing in the transport sector, it is clear that government intervention could play a significant part in routes to adoption, to mitigate market failures, maximize equitable benefits to cities and drive industrial policy goals. Both central and local authorities can support the opportunities for the freight industry. They could, among other things, facilitate collaboration between companies and clarify legislation. They could also lead by example, for example by requiring their procurement and deliveries to use consolidation facilities, or by supporting the roll-out of connecting infrastructure. How tightly should government constrain data use? The ‘Individual Freedoms’ scenario expects individuals to value their liberty and privacy, and so choose not to trust companies with their data. These limits to data-sharing constrain the roll-out of Mobility-as-a-Service and the rate of automation. Should government incentivize sharing behaviors? The ‘Greener Communities’ scenario is driven by people prioritizing environmental and social values over individual freedom of choice. This sees an increase in the use of shared transport, decreases in congestion and CO2 emissions, and improved air quality, but at the cost of flexibility and personal freedom. Should there be a national vision for the transport system? The ‘Trends Unmodified’ scenario shows that if decisions are made incrementally as the system evolves, the adoption of new technology is likely to be patchy, and good practice will only be focused on certain areas or systems; government leaves investment choices to the private sector. This new technology will be poorly integrated and some places and people may be left behind. This demonstrates the importance of having a clear national vision, combined with a systems approach, to achieve the best outcomes for all citizens. Households, businesses, regions, and modes trying to make optimal decisions in isolation are unlikely to result in the best outcomes for the transport system as a whole. 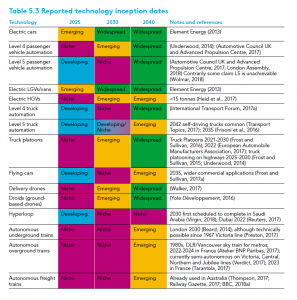 How should new mobility technologies be introduced? The ‘Technology Unleashed’ scenario has the UK swiftly adopting new technologies, but with growing inequality and job losses (faster than for other scenarios) due to automation. New technologies are usually expensive and likely to roll out first to early adopters with higher incomes. Then, as the price falls, they become more available to the less affluent. The government could consider reskilling people in advance of coming automation, particularly in passenger transport. The rise of automobility in the last century left behind some women, ethnic minorities and those who could not afford a car. History, alongside this scenario, raises important questions: who may be left behind by new technologies? What will the implications be for them, and for the geographies that are excluded?